When you click the feedback number next to a member’s User ID, you’ll see all the tools you need to gauge the member. 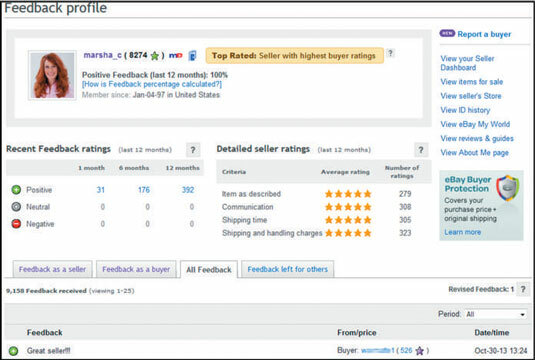 Think of your feedback profile as your eBay report card. Your goal is to get straight As — in this case, all positive feedback. Unlike a real report card, you don’t have to bring it home to be signed. Your User ID: Your eBay nickname appears, followed by a number in parentheses — the net number of the positive feedback comments you’ve received, minus any negative feedback comments you may have (but that wouldn’t happen to you). Your Membership Information: Listed here is the date you first signed up as a member of the eBay community. Below that is the country from which you’re registered, your star rating, and any icons leading to more areas related to you on eBay, such as your About Me page. This area also notes whether you have an eBay Store. Detailed Seller Ratings: This area sums up the ratings, from one to five, that buyers have left for you. Your Recent Feedback Ratings: This area is a scorecard of your feedback for the last 12 months. At the bottom of the feedback tote board is a summary of your bid retractions in the past six months — the times you have retracted bids during an auction. You can’t retract a bid just because you found the item elsewhere cheaper, or you changed your mind, or you decided that you really can’t afford the item. If that’s the case, message the seller directly and ask the seller to please remove your bid.